Two idiots calling themselves Shed Racing made their amateur racing debut at NASA's May 14-15 event at Thunderhill Raceway Park, in the GTI Cup class. The weekend had an excellent turnout, with 7 GTI Cup cars running, for the largest GTI field in the past several years. Ron and Tom split the driver and crew duties, with Tom driving Saturday and Ron Sunday. We got to the track Friday night, found an excellent parking spot next to the track exit and pre-grid, and set up shop, installed the air dam and connected the brake ducts. 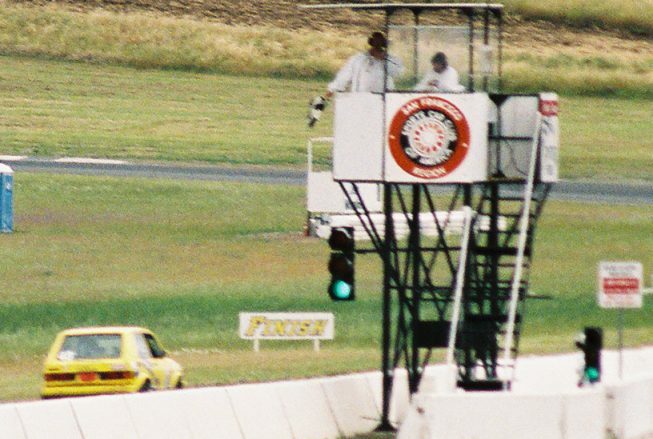 This was the first time with the race car on the full Thunderhill track, as our previous visit for the SCCA licensing school was run on only the front half. Miller Motorsports was next to us in the paddock. We admired their nifty aluminum racing floor jack, immediately causing it to fail . They mocked us for forgetting to bring jack stands. We mocked them for waiting until they got to the race track to do their routine maintenance. Saturday was clear and hot, up to about 90º, with the asphalt measured at 116º. The first session of the day was a combined warm-up for race groups A and B, for a total of 54 cars on the track. Between getting the feel for the track and trying not to get run over by cars turning ~30 seconds faster laps, Tom improved every lap, finally getting down to 2:23.7. His only off track excursion of the weekend was minor, 4 wheels barely off on the exit of 14, Qualifying was much better, with more familiarity on the back side of the track, lap times improved to 2:21.8, putting us 5th on the grid, ahead of a Dan Pina with a rough running car, and David Pina, who didn't show up until after qualifying, but hey 5th is 5th . The class pole was Joe Craven with a 2:16.9. The overall pole was a Robert Stefanovich in a monster turbo Porsche with a 1:50.7. After two 20 minute sessions, the fuel gauge was between half and 3/4. Thinking our right turn fuel pickup problem was fixed Tom opted not to fuel the car. He would regret this decision. The race began from a standing start, with all the GTIs grided together at the back of the pack. The flag fell, Tom got a good jump thanks to the "GREEN-GREEN-GREEN" radio call from Ron and passed a few cars into turn one. He had to lift briefly for traffic, and gave up both his momentum and the places he gained. Hold steady through turn 2, downshift to 3rd and turn into 3, and as the car settles into the right turn, it sputters. It sputters again in 5a, the next right turn. Looks like the fuel pickup problem wasn't fixed after all. Carlos Suarez and Scott Neville go 3 wide passing an MR-2, chasing Joe Craven and Dan Piña. Don Bailey is close behind. The MR-2 driver is listed as Stephen Singley. There wasn't anyone close behind, and Thunderhill is mostly left turns, so Tom kept going and completed the first lap, (so he would get credit for starting the race if we retired) then hit the pits at the end of lap 2. We weren't sure if we would be allowed back on track if we refueled, but figured we would throw in some gas and give it a shot. We reentered the race 2 laps down from the rest of the class. The rest of the race was uneventful, except that after taking the white flag the race winner passed Tom on his cool down lap. He figured he was going to finish last anyway, so to hurry things along he followed the winner him into the pits without taking the checkered. We finished last in class, and 40th overall, listed on the results ahead of two guys who didn't start the race and 2 DQs. 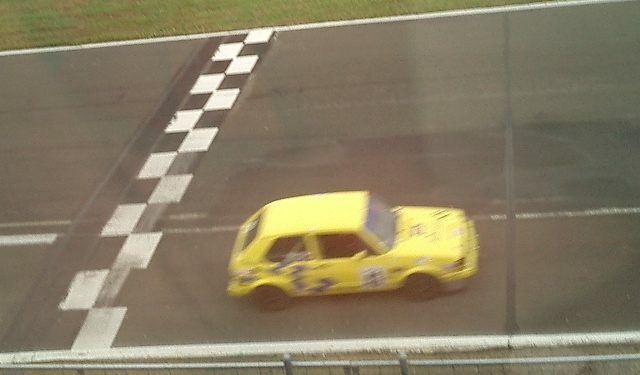 GTI class winner was Joe Craven, followed by Don Bailey and Scott Neville. Sunday was much cooler, overcast with sprinkles of rain throughout the day. It was Ron's turn in the car, and Tom took his position on the roof of the motorhome. Ron ran similar to Tom, improving each lap finishing at 2:23.05. He was lucky enough to be able to follow some of the other GTIs for a while and learn their lines. Ron's qualifying run started a little shaky, with 2 wheels off after T6 early in the session, followed by a half spin in the dirt outside 12. He got his head screwed on straight and put some solid laps together, finishing with a 2:19.78, which still put him last in class, but within a half second of the next two faster Rabbits, Calvin Wan and Scott Neville. GTI class pole for the Sunday race was Joe Craven again, with a 2:15.52, overall pole was again Robert Stefanovich's Porsche, with a 1:50.9. For the race Ron got a good start, but about 2 laps in a Ford Capri blew it's engine and dumped oil all over the T5 bypass. A handful of cars spun in the oil, and the pace car came out while the cleanup crew did their thing. Two of the GTI class cars (Joe Craven and Scott Neville) retired with broken hubs, and David Pina was a DNS, putting Ron 4th in class. He was reeling in Calvin Wan in the 3rd place car in the last lap when a RX7 got in the way, preventing any attempt at making the podium. We don't know if Ron could have got around him, but he was a full second per lap faster the final 3 laps, running consistant 2:19s. He got a great run on Calvin going up the hill to turn 9, expecting the RX7 to make a move and hoping to follow the RX7 for the pass, but the Mazda never made the move. 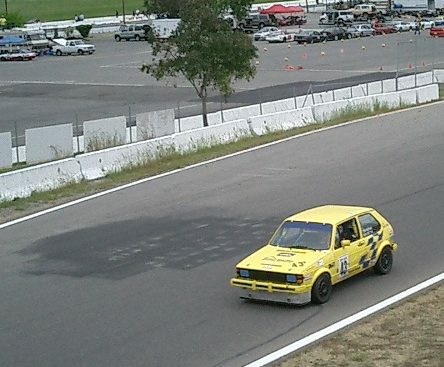 He took the checkered 27th overall, 4th in class. 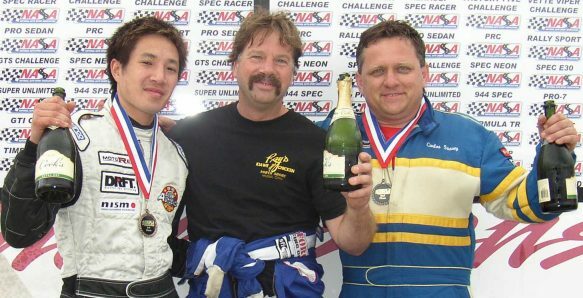 Don Bailey took the class win, followed by Carlos Suarez and Calvin Wan. I won't go into details on the trip home, except to say it involved pulling most of the fuses in the RV's fuse block, zip ties, unplugging one headlight on the RV and turning on the parking lights on the racecar on the trailer.